Implementation of the inventory system. Referenced by LLInventoryItem::fromLLSD(), ll_create_item_from_sd(), and ll_create_sd_from_inventory_item(). Referenced by LLInventoryItem::fromLLSD(), ll_create_category_from_sd(), ll_create_item_from_sd(), ll_create_sd_from_inventory_category(), and ll_create_sd_from_inventory_item(). 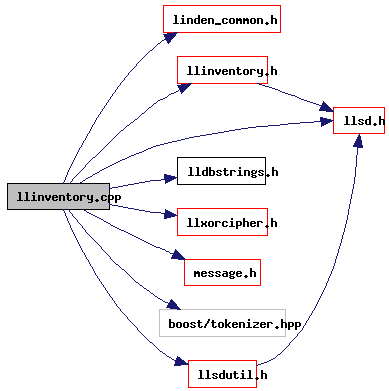 Referenced by ll_create_category_from_sd(), and ll_create_sd_from_inventory_category(). Definition at line 1307 of file llinventory.cpp. Definition at line 1301 of file llinventory.cpp. References a, b, and LLStringBase< char >::compareDict(). Definition at line 1629 of file llinventory.cpp. References INV_ASSET_TYPE_LABEL(), INV_FOLDER_ID_LABEL(), INV_NAME_LABEL(), INV_PARENT_ID_LABEL(), INV_PREFERRED_TYPE_LABEL(), and LLAssetType::lookup(). Definition at line 1577 of file llinventory.cpp. References LLXORCipher::decrypt(), LLSD::has(), INV_ASSET_ID_LABEL(), INV_ASSET_TYPE_LABEL(), INV_CREATION_DATE_LABEL(), INV_DESC_LABEL(), INV_FLAGS_LABEL(), INV_INVENTORY_TYPE_LABEL(), INV_ITEM_ID_LABEL(), INV_NAME_LABEL(), INV_PARENT_ID_LABEL(), INV_PERMISSIONS_LABEL(), INV_SALE_INFO_LABEL(), ll_permissions_from_sd(), ll_sale_info_from_sd(), LLAssetType::lookup(), LLInventoryType::lookup(), MAGIC_ID, LLUUID::mData, and UUID_BYTES. Definition at line 1607 of file llinventory.cpp. References LLAssetType::AT_NONE, INV_ASSET_TYPE_LABEL(), INV_FOLDER_ID_LABEL(), INV_NAME_LABEL(), INV_PARENT_ID_LABEL(), INV_PREFERRED_TYPE_LABEL(), LLPointer< Type >::isNull(), llendl, llwarns, and LLAssetType::lookup(). Definition at line 1551 of file llinventory.cpp. References LLAssetType::AT_NONE, INV_ASSET_ID_LABEL(), INV_ASSET_TYPE_LABEL(), INV_CREATION_DATE_LABEL(), INV_DESC_LABEL(), INV_FLAGS_LABEL(), INV_INVENTORY_TYPE_LABEL(), INV_ITEM_ID_LABEL(), INV_NAME_LABEL(), INV_PARENT_ID_LABEL(), INV_PERMISSIONS_LABEL(), INV_SALE_INFO_LABEL(), LLPointer< Type >::isNull(), ll_create_sd_from_permissions(), ll_create_sd_from_sale_info(), llendl, llwarns, LLAssetType::lookup(), LLInventoryType::lookup(), and S32. Referenced by LLInventoryItem::asLLSD(), LLInventoryItem::exportFile(), LLInventoryItem::exportFileXML(), LLInventoryItem::exportLegacyStream(), LLInventoryItem::fromLLSD(), LLInventoryItem::importFile(), LLInventoryItem::importLegacyStream(), LLInventoryItem::importXML(), and ll_create_item_from_sd(). Definition at line 67 of file llinventory.cpp. Referenced by LLViewerObject::doUpdateInventory(), and LLToolDragAndDrop::handleDropTextureProtections(). Definition at line 66 of file llinventory.cpp. Referenced by LLViewerObject::doUpdateInventory(), LLToolDragAndDrop::dropInventory(), LLPreview::onCommit(), LLFloaterProperties::onCommitDescription(), LLFloaterProperties::onCommitName(), LLFloaterProperties::onCommitPermissions(), LLPreviewNotecard::onSaveComplete(), LLPreviewGesture::onSaveComplete(), LLTaskInvFVBridge::renameItem(), LLViewerObject::saveScript(), LLFloaterProperties::updateSaleInfo(), and LLViewerObject::updateViewerInventoryAsset().